Think Global’s Membership and Public Affair’s Manager, Rebecca Sharkey, talks about our recent joint event with DEED in Dorset to find out more about the United Nation’s Sustainable Development Goals and discuss how to use them as a framework for action. 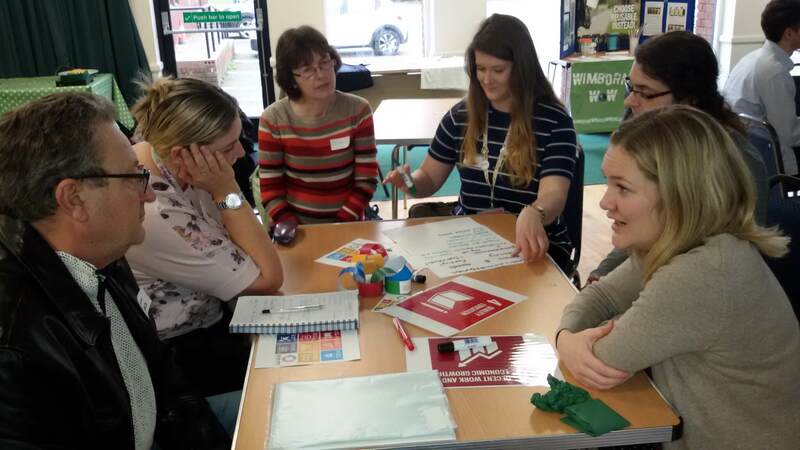 I was really impressed with the range and number of people who showed up on a Monday afternoon in January in Wimborne in Dorset, to find out more about the United Nation’s Sustainable Development Goals (SDGs) and discuss how to use them as a framework for action. The joint event between Think Global and our partner DEED in Dorset, was an opportunity for local community groups, businesses, shops, organisations and individuals to come together to ‘think global – act local’. It was inspiring and heart-warming to hear from the amazing eco-friendly nursery chain, fairtrade and #LoveDorset activities, engaged local Councillors, Wimborne WOW (War on Waste), Sustainable Dorset activities, and the Student Union rep describing the amazing work they are already doing around SDGs at Bournemouth University. Everyone seemed to agree that using the SDGs (also called ‘Global Goals’) as a framework was a helpful way to bring together their different strands to network and share ideas, as well as to understand how they are all connected and contributing to creating a better world. We discussed which SDGs need to be prioritised in order to tackle global challenges, such as ending hunger and climate action; and in the following session we used the SDGs as a framework to discuss local actions, such as increasing awareness and use of fairtrade products and reducing use of disposable coffee cups and plastic bags. We watched an introduction to the Global Goals with Malala, and there were presentations and discussions on issues arising from Think Global projects SUSY (promoting the social and solidarity economy, SSE) and Supply Cha!nge (‘Make supermarkets fair’) projects. And the room was buzzing with people networking over lunch and during the well-run sessions and activities. The feedback from the day was really positive, with people saying that there hasn’t been an opportunity like this locally bringing together single issue campaigns for years. Our wonderful colleagues at DEED, who usually work with schools, said it made a nice change to deliver community-based global learning with adults in the community. Like the event we held with Liverpool World Centre on similar themes, it was great getting people excited about thinking about the SDGs at local, national and global levels, encouraging everyone to see how they are already contributing positively and empowering them to connect even more with people and ideas.